Keep your Screen Fresh with Srolling News feeds. You can keep your screens fresh with scrolling/sliding text tickers using RSS feeds with piSignage. RSS Feeds are provided by all the Global News Sources like BBC,CNN, Sky etc to name a few. 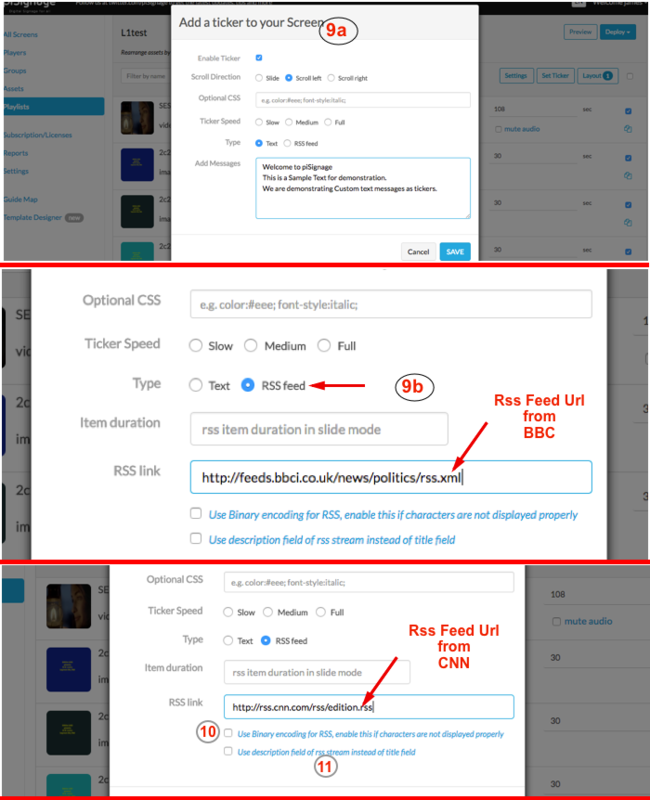 You can choose feeds based on topics you prefer, It could be news, sports, health, entertainment etc. Or they can be Custom messages created by you. Playlist level : Unique ticker for each playlist. 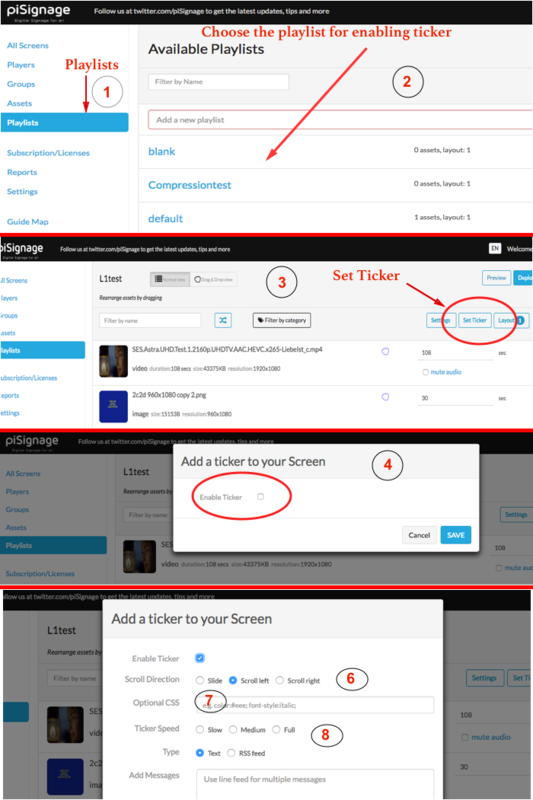 1) Go to playlists in the left panel of your piSignage account. 3) Click on the Set Ticker at the top right. 6) In the Scroll Direction Chose How you need the text displayed. * The texts can be displayed as slides appearing one after another. 7) The Optional CSS lets you tinker with the styling of the text like Color,Font size etc.The default Text color is white. for example enter font-size :__px to change font Size. 8)Ticker Speed lets you choose the speed of the Scrolling. With piSignage You can choose RSS Feeds provided by reputed News Sources Or you can create your own Custom Text. 9a) Select the Type Text to Create Custom Messages. When you check the Text Button A Text box is visible. Enter the text you want to be Displayed. If you have multiple messages Enter them line by line. 9b) Select the type RSS Feed if you want to display RSS tickers. 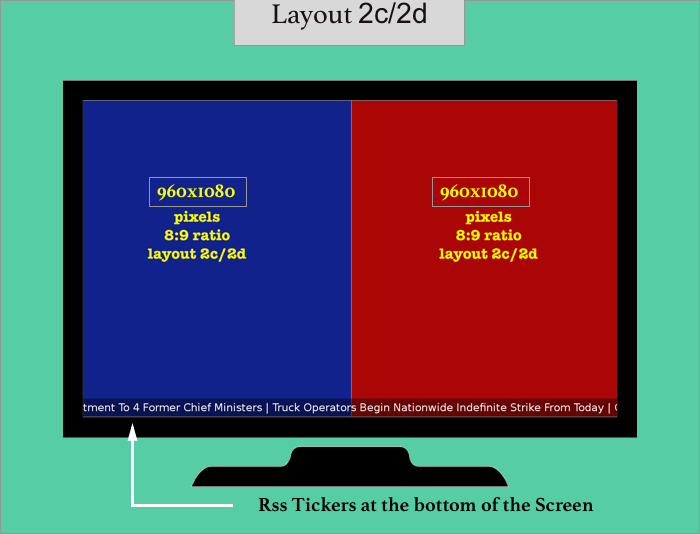 10) Check Binary encoding box if there is any problem with Ticker text display. 11) An RSS Feed has 2 parts, Title and a Description. While Displaying a ticker, displaying feed titles are more logical as they have the Gist of the News. So Chose title field by keeping the box unchecked. But You can also use description fields of the feed by Checking the box. 12) The item Duration box lets you choose the amount of time each message is displayed only if you are Using Slide Mode(Step 6 above) in Scroll Direction. You can leave it Blank as the default value is appropriately set. Save the Setting. Whenever this Playlist is deployed, the Ticker will be Displayed. For the RSS Feed to be loaded and refreshed the player needs an active internet connection .If the Internet is Disconnected after the Initial Loading of ticker, the Initially loaded Ticker will keep running without getting updated. Only if there is an internet connection the RSS Ticker content will be freshly loaded whenever there is a change. No Such issues if you have Custom messages. Common Ticker for a Group. In piSignage You can Schedule multiple playlists during a day. Now as mentioned above, Every playlist can have its own ticker. On the other hand You can have a common ticker for a Group.Read more about (Groups Feature) in piSignage. This Group ticker will only be displayed if the playlist Does not have an Ticker associated with it. The playlist Ticker has higher precedence. Go to Groups in the left panel of your account. Click on the Set Ticker at the top right side of the page.